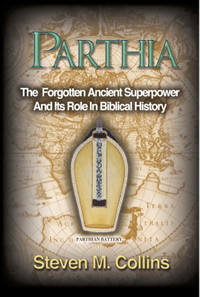 This book details the history of the greatest Israelite empire in the post-exilic period: Parthia. Even Roman writers acknowledged it was the equal of the Roman Empire. In fact, its forces frequently defeated Roman armies in many wars, and Parthia was the only empire that Rome actually feared. Just decades before the birth of Christ, its armies drove the Romans completely out of Palestine, Syria and Asia Minor, forcing the reigning King Herod to flee for his life. This ancient superpower rival of Rome that lasted for half a millennium was the Parthian Empire. Its Semitic/Israelite origins are well documented as well as the fact that its single dynasty was descended from King David. The Parthian Empire rose to power as Carthage fell, and the names of Israelite tribes and clans are in evidence within the Parthian Empire. Parthia's first capital city was named after "Isaac." Josephus, the famous Jewish historian, records that the ten tribes were a very numerous people in Asia and he identifies them as living in Parthia's empire. Secular histories have long acknowledged the Parthians were related to the Scythian tribes, and Scythian "Sacae" tribes often assisted the Parthians in their wars against Greece and Rome. The reason for Parthia's omission from history texts is clear: If its origins and histories were examined in any detail, its Israelite origins would become obvious. That would confer great credibility on the Bible and its prophecies about the Israelites, and evidence leading to such conclusions is simply omitted from modern, evolutionary-based history books. Parthia and Rome fought battles that were among the largest and most pivotal ever fought in the ancient world. The Roman Triumvir, Crassus, met an ignominious death fighting the Parthians and Mark Antony led a large army into Parthia, but was driven out and barely escaped with his life. Parthia was governed by the feudal system that later resurfaced in Europe. Its Emperors were elected by Parthian elites from the royal dynasty, and it even offered "home-rule" to some of its larger cities. While Rome's rulership was harsh and oppressive, Parthia's was enlightened and much wiser. Nations sometimes fought Roman armies in order to be part of the Parthian Empire instead of the Roman Empire. The Parthian and Roman Empires waged epic wars, had "summit conferences" between their emperors and even had a period of "detente" during which Jesus Christ lived his entire life. Some of the events of Jesus Christ's life become more understandable when they are examined in light of the politics that prevailed between Rome and Parthia at that time. One group of the Parthian elites that chose Parthia's emperors was called the "Magi" or "Wise Men." A delegation of these high Parthian officials worshipped the young Jesus Christ. and why the Magi's visit almost led to a major Parthian-Roman war. The Roman rulers of Judea were well aware of Parthia's interest in Jesus Christ, and some accounts in the Gospels "come alive" in a new way when this fact is taken into account. The critical role of Joseph of Arimathea in the life of Jesus Christ is examined, as is evidence of where Jesus Christ was and what he was doing during the "missing eighteen years" of his life that are not discussed in the Bible. After Parthia defeated the Roman Empire in an immense war in the 3rd century BC, it was overthrown by the Persians who had been Parthian subjects for centuries. The Persians drove the Semitic Parthians out of Asia, and their destination is detailed in the final book in the series.